This page describes tools and resources developed at NaCTeM to aid with the processing of biomedical text in the Chinese language. 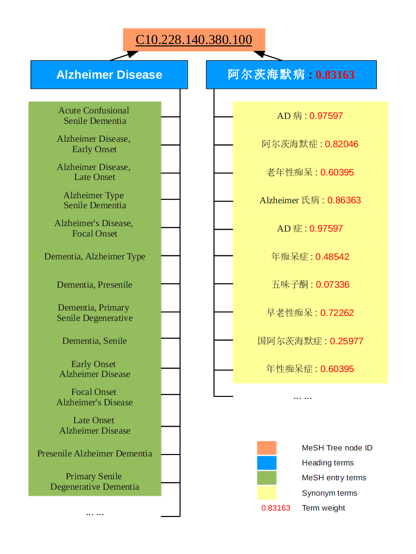 NaCTeM's TerMine service has been adapted to handle the extraction of terms from Chinese biomedical text. This adaptation consists of the sequential application of two pre-processing steps prior to running the existing TerMine service. Firstly, an open-source newswire-domain Chinese POS tagger, i.e., the FudanNLP POS tagger is applied to the Chinese text, followed by a set of processing rules, which are designed both to correct incorrect segmentation of the Chinese text into individual words and to correct POS-tagging errors. The Chinese biomedical term extraction workflow is shown in Figure 1. The workflow has been made available as a web service, which has already been used by Socrates.md to develop a biomedical information retrieval system. A demo of the biomedical term extraction web service will be available on this page shortly. Bilingual. Each tree node has English and Chinese terms, which are aligned using heading terms. Heading terms. Each English heading term has an equivalent Chinese heading term, aligned via tree node number. Entry terms. 132,108 entry terms, which are English terms from MeSH vocabulary, are added to the MMeSH Tree and organised in terms of their heading terms. Synonymous terms. 188,478 synonymous terms, most of which are Chinese term, are automatically extracted from online texts and involved in the MMeSH Tree. Term weights. Each Chinese term (including heading term and synonyms) is assigned a term weight, which is computed based on the frequency of the term and the frequency of its English heading term. Figure 2 illustrates an example of a tree node in MMeSH. The MMeSH ontoglogy has been used to facilitate query expansion in a Chinese-English biomedical cross-lingual information retrieval [2, 3]. Dr. Xinkai Wang obtained his PhD degree at the University of Manchester in January 2012. His research areas are cross-lingual information retrieval on Chinese biomedicine and Chinese biomedical term extraction. He is currently working as consultant on the Socrates' project. 1. Xinkai Wang and Sophia Ananiadou. A Task-Oriented Extension of Chinese MeSH Concepts Hierarchy. In Proceedings of the 2nd Workshop on Building and Evaluating Resources for Biomedical Text Mining, pages 23-30, Malta, 2010. 3. Xinkai Wang. Chinese-English Cross-Lingual Information Retrieval in Biomedicine Using Ontology-Based Query Expansion. PhD thesis, University of Manchester, 2012.